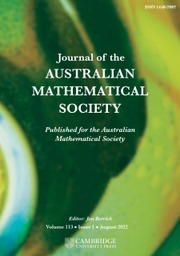 The Journal of the Australian Mathematical Society is now published and distributed by Cambridge University Press. Please access their site (e.g. by clicking the cover image at right) for subscription information and costs for issues dated from 2008, and all back issues (scanned, with OCR) from 1959 onwards. Prior to 2008 it was available in both print and electronic forms. These pages also contain (unrestricted) electronic copies of Volumes 64 and 65 from 1998 which were prepared as part of our trial of electronic publishing, and scanned reproductions of all the articles from Volumes 43 to 59 (1987–1995). Furthermore, in support of the moving wall concept, issues that are more than 5 years old are freely available without subscription.